Historic Middleport Pottery in Staffordshire becomes a hive of festive activity during the Christmas season with opportunities for groups to buy unique gifts coupled with a delightful visitor experience in the working factory. Middleport was built in the 19th century as a model pottery. Visitors today can enjoy the original features of the buildings including an enormous bottle kiln and enjoy a personalised tour of the home of world famous Burleigh ceramic ware. Groups looking to buy the perfect Christmas present are spoiled for choice with a wide range of traditional and modern gifts available as part of the Middleport festive shopping experience. As well as the popular Burleigh factory shop, Middleport boasts a range of studios showcasing the work of some of the area’s finest artistic talent. Artists working from the studios produce and sell a wide range of handmade, high quality gifts from ceramic ornaments, wall hangings and tableware to jewellery, photographic art and furniture. The studios also present a unique opportunity for visitors to meet and see the artists at work as they prepare their wares for sale. In addition, the visitor attraction boasts a scenic canalside tearoom serving a range of warming food, teas, freshly brewed coffee and cakes for those looking to enjoy a leisurely time shopping. The Middleport experience includes a visitor centre with original Victorian offices, steam engine, the enormous bottle kiln – one of few remaining – and Europe’s largest collection of ceramic moulds, along with the Middleport Studios and the Burleigh Factory Shop. The centre is open from 10am until 4pm daily. 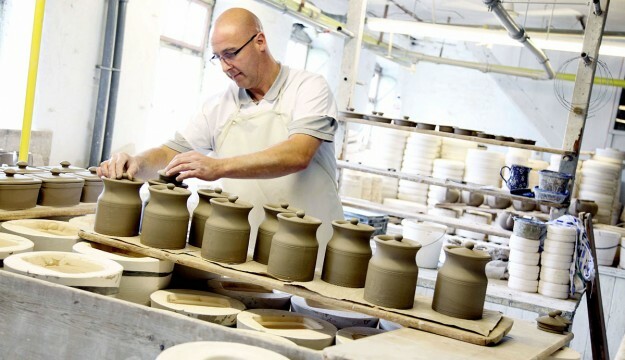 The Middleport factory tour gives visitors the unique opportunity to see pottery produced from start to finish using techniques dating back to the 1880s. Tours are £7 per person for groups over 10 people.